Lombok Island is now known as the Gili islands are composed of three small islands. The meaning the word of gili is the islands. There are three Gili on Lombok which is now a tourist destination for a vacation. Because the island has three natural scenery and beauty of the underwater very enchanting and amazing in Indonesia, than Bali. Lombok is located in the east of the island of Bali. The island has a condition similar to Bali. Most of the population on the island is derived from Bali. Culture and the arts community is almost the same as in Bali. Mount Agung Bali has the highest mountain and purified, while Mount Rinjani Lombok has the highest mountain and purified by residents of Lombok. However Lombok is not a province, in contrast to Bali is a province with nine counties and cities. The island reaches 5,435 km ².
Lombok is located very close to Bali, so the growing tourism sector in Bali is indirectly affected the island of Lombok. Since 2007, economic growth depend on the tourism sector. Since then a lot of tourism promotion intensively conducted by the local government. With satisfactory results, Lombok has now become one of the island's most searched by tourists after Bali. Lombok island has now become one of the icon of Indonesian tourism. The natural beauty of Lombok island competition for Bali Indonesia. Bali has become a very crowded and rundown, while Lombok is still very quiet and has a nature that is still awake. Friendliness of the Sasak community, beautiful beaches with white sand and very clean, coral reefs and underwater natural beauty extraordinary grandeur of Mount Rinjani and cultural uniqueness of many awe-inspiring travelers. Rows of Gili islands is a range of the most beautiful island located in the northwest of the island of Lombok. There are three Gili islands are now developing into a well-known attractions in Lombok, namely Gili Trawangan, Gili Meno, and Gili Air. The three islands have a very beautiful view, with white sandy beaches and clean, with a very clear sea, yet polluted industrial wastes contained in Bali. The area around the three islands are known to have a very beautiful marine park. 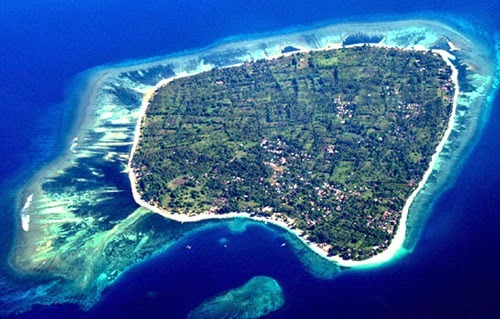 Region of three Gili, is located in the Gili Indah village, district of Tanjung. Gili is a small island and beautiful that can be found in West Lombok regency. There are many islands in West Lombok, but until now only three islands visited by tourists. The time taken to achieve the three islands from Lombok island is about 30 minutes, depending on sea conditions with wind and ocean wave height. When you are in the middle of the sea on the way to Gili, you will see stunning scenery. The sea water is crystal clear dark blue, light blue, and light green. In fact you can see the bottom of the sea from the boat, because the ocean around the island of Gili very clear and clean. Third exotic island does have a unique characteristic differences. Each of them has a natural atmosphere and a different characteristic. Gili Trawangan is the largest of the three Gili islands located in the northwest of Lombok. Gili Trawangan is the highest island. The island has a length of 3 km, and 2 km of wide. Gili Trawangan has been inhabited by a population with a population of about 800 people. The most densely populated part is east of the island. Of the three Gili, Gili Trawangan has the facilities for tourists of the most diverse. On the island of Gili Trawangan, tourists can see matarahi rise in the morning and late afternoon when the sun sets, without the need to move the location or leave the island. Trawangan has shades of the party more than Gili Meno and Gili Air, like in Kuta Bali Indonesia, the island is also a nightlife. Party all night every night, the show rotated by some public places. Popular activities conducted in Trawangan tourists are scuba diving, snorkeling, kayaking, and surfing. There are also several places for tourists to learn to ride around the island. Gili Trawangan there are no motorized vehicles, because it is not allowed by the local rules. Common means of transport is a bicycle dipper and cidomo. Cidomo is simple horse-drawn carriage which are common in Lombok. 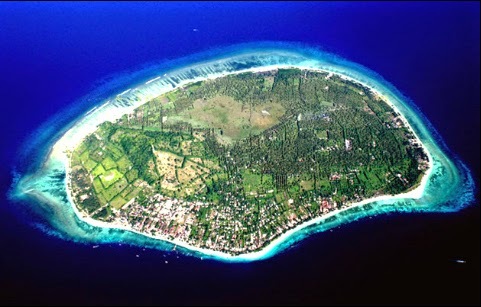 Gili Air is an island with an area of 170 hectares. The island is already inhabited, but the population is very small if compared to population in Gili Trawangan. The island is a favorite spot for tourists who want to find serenity. In Gili Air, tourists can engage in social interactions performed by the natives on the island. Gili Air sea region, there is snorkeling and diving spots are very nice, the sea in around the island has a beautiful underwater scenery, with a very diverse marine life. Residents on the island of Gili Air in Lombok is very friendly. They will give a genuine smile with the presence of tourists. They welcomed the arrival of tourists as guests. Residents on the island is extremely uphold norms and decency, so you'd better keep your attitude and courtesy while on the island. You can stay at any of existing homes on the island, of course with appropriate rewards they will receive you with pleasure. You will be in herbal medicine as a visiting guest. So your behavior will determine their attitude to you. In this island there are only a few hotels. Gili Air is, an ideal area for solitude. Deserted, while in this island, we just listen to the sound of waves and seagulls who are looking for fish in the sea. Clean white sand beaches. 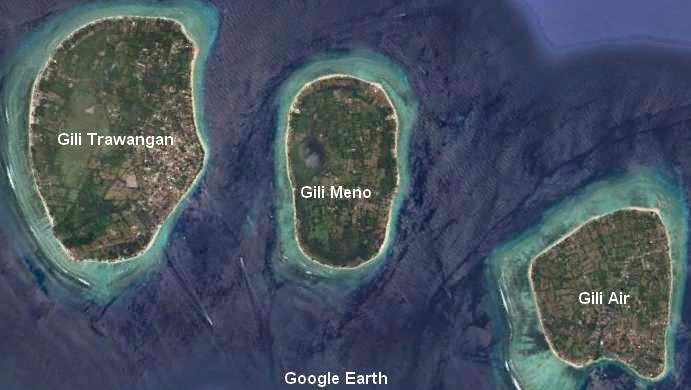 Gili Meno is the smallest island. 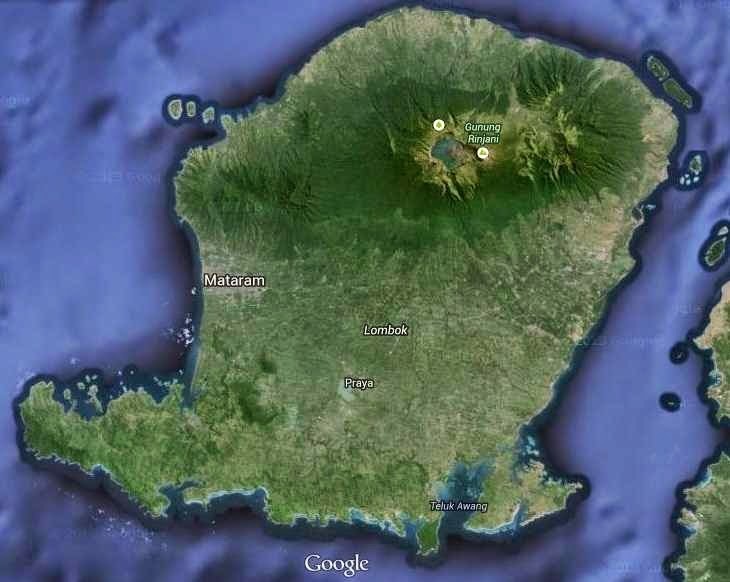 The island can be reached from the city of Mataram, Lombok, about 45 minutes by road past the Senggigi Beach. In this island there are bird park, with a collection of rare birds from Indonesia and abroad. Beach with white sand and pristine. Gili Meno is very limited motor vehicles, as well as the use of electricity. If you've visited Gili Air and Gili Trawangan, it could not hurt to at Gili Meno is very charming. In contrast to Gili Trawangan and Gili Air, Gili Meno has the smallest land area and is only home to about 300 native people. No hotels, shops, restaurants. Travelers should have their own inventory so as not to starve while on the island. 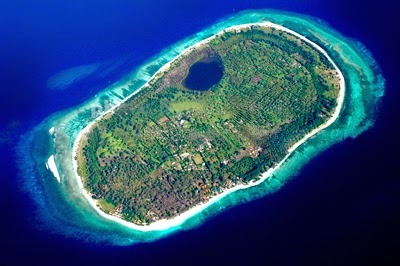 Gili Meno has a natural beauty that does not exist in the two Gili. In this island there is a salt lake and spectacular dive angle, like Meno Wall, Sea Turtle Point, and Blue Coral Point. Coast in the eastern part of the island is very nice and suitable for snorkling. Gili Meno you will find a sea turtle swimming freely and colorful coral species.